Located “on the bench” above the historic village of Jordan, St. John’s Church is celebrating its 175th anniversary. It all started in 1841 with George Ball conveying four acres of land to the Diocese of Toronto for the purpose of building an Anglican church. Built of local stone by stonemasons Andrew Dalrymple and Newton Perry, it probably followed the design of John George Howard. The morning sun streams through the huge stained glass window with the appropriate theme for a rural congregation — “the sower went forth to sow”. Pulpits and altar rail made from local walnut, kneelers and hangings worked by the ladies of the congregation all depict many hours of shared handiwork. Our antique bell still calls the members to worship on Sunday morning. Our enthusiastic choir, led by organist Lawrence Eady at the Karl Willelm organ installed in 1984, leads the singing from the balcony. We worship at 9:00 a.m. and 10:30 a.m. using the revised prayer book. From 1920 to 2007 we had a mission church, St. Mark’s, located just west of St. Catharines. Over the years, as our needs changed, we built a parish hall on an enlarged acreage acquired in the 1960s. Our grounds also offer a public cemetery with two columbaria. Our celebration of everything old took place on a Saturday in June with a fashion show by the Westfield Heritage Village, a Victorian Tea and an outdoor display of antique cars and equipment. On September 18th, our celebratory service was led by Bishop Michael Bird who spoke on the theme from l Peter – “and like living stones, let you be built into a spiritual house”. 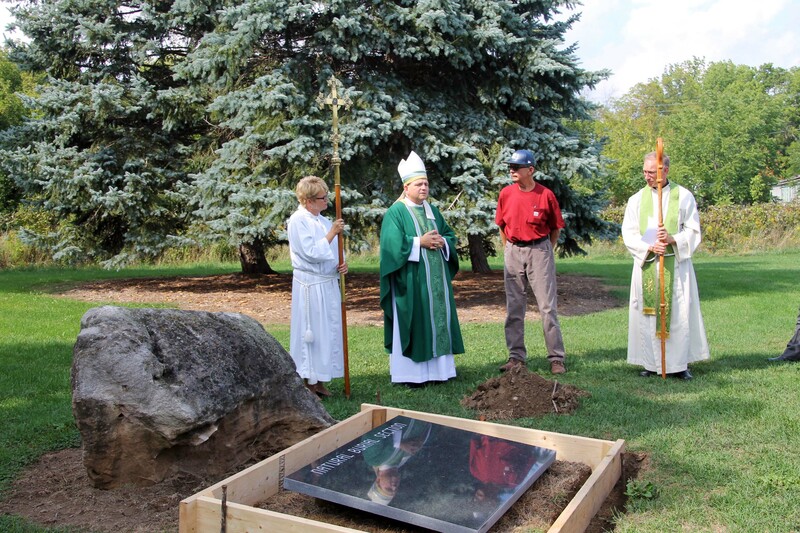 The Bishop blessed a new painting of the church by Joyce Richardson-Tufford, as well as the columbaria installed in 2015. Mayor Sandra Easton presented a certificate with greetings from the Town of Lincoln. Following the service guests and members enjoyed a buffet lunch and a time of fellowship and reminiscing. Included among the historical photos and articles on display was a Prayer Book dated 1842 sent by the Church in England – actually the Society for the Promoting of Christian Knowledge. A Bible and Altar Book given at the same time are in the Diocesan archives. October was another busy month for us at St. John’s. We held an Open Doors event with tours of the historic church in conjunction with the annual Pioneer Day celebrations in the Village of Jordan, sponsored an event to raise money for the Refugee Committee and held a farewell dinner for our beloved rector since 2011, the Reverend Kevin Block and his wife Marilyn. Joyce Short is the parish historian and long-time member of St. John’s Jordan.